MODEL INFORMATION: Timberwolf > 18/100G - 4"
Timberwolf 18/100G - 4" model. This is the longest-running chipper in the Timberwolf range. First developed in 1990, this was our first chipper designed to run on its own road chassis., This chipper was refined over several years and reached its current form in February 2005. The design concept for the TW 18/100G was to create a strong, simple, go anywhere chipper, with impressive performance at an affordable price. The ‘strong’ is achieved by using exactly the same gauge of material in the rotor housing as our much larger 35hp TW 150DHB. This means that some parts of the rotor housing are up to 10mm thick! 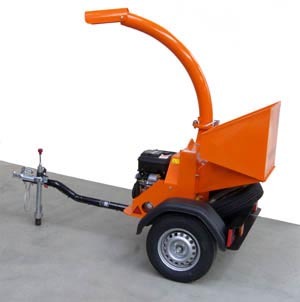 To keep it ‘simple’, the chipper has no hydraulics and a robust recoil start 18hp engine.